Apple has finally unveiled its smaller version of iPad i.e. iPad Mini. It is just 7.2mm thick, weighs 0.68 pound, has a dual-core A5 processor just as iPad2 with 7.9-inch Multi-Touch display and with Wi-Fi and LTE connectivity. 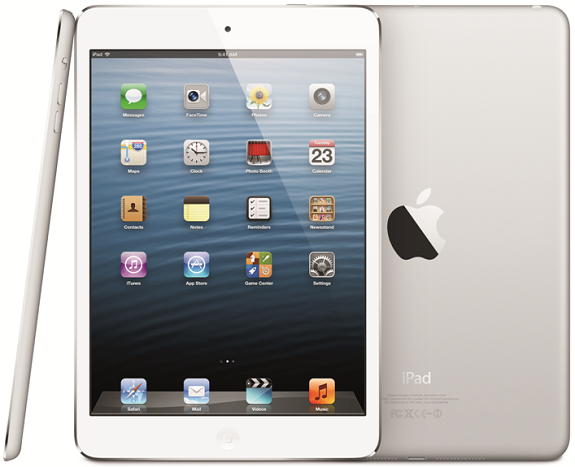 iPad mini pricing starts at $329 and will be available to order on November 2. All existing iPad apps that are in Appstore will work on the iPad mini due the fact that it comes with the same resolution and ppi of iPad 2 i.e 1024-by-768 resolution at 163 pixels per inch (ppi). Hence you need not worry about whether the existing apps will work on iPad Mini or not. It is a great buying consideration while buying a tablet whether its a Android tablet or even iPads. In terms of Camera, it comes with some major upgrade over iPad2. It comes with a 1.2MP front camera with 720p HD video capability which can be used for FaceTime video calling. The other one, iSight camera of 5MP with autofocus , Face detection, Five-elements lens, Hybrid IR filter with ƒ/2.4 aperture. Both cameras feature backside illumination to let users capture great pictures even in low light.